More than a pick-up, a community service! If you’re here, I don’t need to tell you what compost is. You wish you could keep food scraps out of your trash. You know it stinks up your kitchen if you don’t take it out every other day. You know how important feeding the soil is. It’s not rocket science, and it helps the environment. Reducing landfill pressure, which means less toxic methane in the air, and less poisonous leachate in our water supply. Replenishing the Earth with nutrient-rich soil, so we can grow nutrient-rich food. Awesome! What if I told you, you could enjoy all the benefits of composting, without ANY of the hassle of having and managing any kind of compost system yourself? Fertile Earth provides you with a 3-gallon bucket to collect your food scraps.. Once a week, or every other week (your choice), we pick up your full bucket, and give you a clean bucket to keep until the next pick up. $8 per pick up for one bucket. Each additional bucket is $5. One bucket is generally enough for a household. Got a neighbor or coworker interested too? Join together and save over 20% each! The Miami Beach Botanical Garden, where our Fertile Earthlings and MBBG staff lovingly care for your food scraps, and transform them back to rich, fertile soil. Since we launched this program in 2016, this CompostHub has kept over 4,000 pounds of food waste out of landfills! Here’s the cherry on top: you can go there and check it out anytime and enjoy the gorgeous gardens! Currently, we pick-up from Brickell, Coral Way, Downtown, Miami Beach and neighboring areas. We are NOT taking any new customers as of Summer 2018. If you'd like to be added to our wait list send us an email at info@fertileearth.or OR reach us through the contact us page. Where do I keep the bucket? Your bucket comes with a lid, so in theory, you could keep it anywhere. But the truth is, unless you keep it in the fridge or freezer, it’s likely to get stinky, and attract unwanted critters (including curious pets). We ask that you keep it in the fridge or freezer for this reason, but if you can’t, we’ll help you figure out another option that works in your home. What can and can’t go in my bucket? Fruit and veggie scraps, peels, seeds, stems, etc. Any grains (rice, bread, pasta, etc.) cooked or uncooked. Eggshells, pistachio shells, or other nut shells. Shredded, unbleached paper (this includes toilet paper & paper towel rolls, and unbleached paper towels and paper napkins). Meat, chicken, fish or any animal meat or bones. Large amounts of oil (whatever is in leftover food is fine, but if you have a bottle of old olive oil, toss it in the trash please). Weeds from around the yard. Pet poop, used tissues, or any household poop. Metal, plastic, styrofoam, or glass of any kind. Bleached white or glossy paper (like junk mail). I’m super busy. Do I need to be home for the pick up? No, you don’t. You can coordinate with your pick-up person where you’ll leave your full bucket and how to get into your condo/building. How often do you pick up? We currently offer weekly and biweekly pick-up options. $8 per pick up, or $5 per additional bucket if multiple buckets are picked up at the same location (like an office or if your neighbor participates with you). You will be billed monthly and pay for the pick-ups in advance. Unused pick-ups will not be refunded, instead they are credited over to the next month. Your commitment is month to month, no long or fancy contract. Let us know as soon as you’d like to cancel and we’ll simply continue picking up until all your paid pickups have been used. If you need to cancel an individual pick-up, notify us within 24 hours to roll your credit into the next month. Cancellations without notice will be billed as usual. Where’s the bucket going to? Can I see the compost pile? 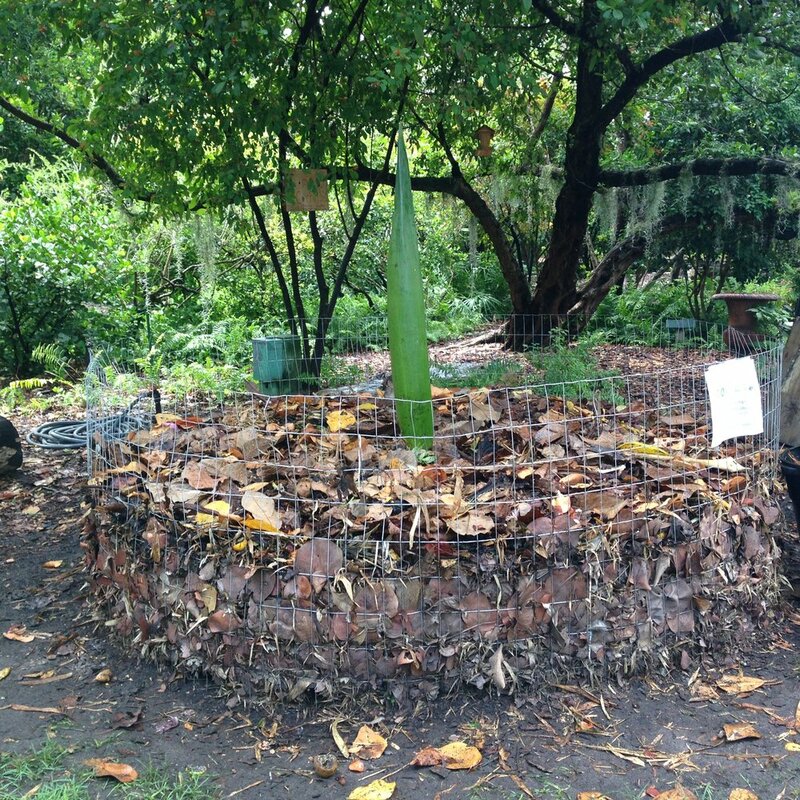 Our Compost Hub is currently located at the Miami Beach Botanical Garden. You can go there anytime the park is open and see for yourself! Can I get finished compost from the Hub? Absolutely! When you need it, just ask. If there’s finished compost available, just go to the garden and take what you need.